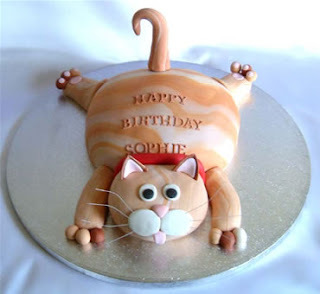 You know how some people spend hours painstakingly creating amazing birthday cakes where every detail is perfect and it looks so wonderful you don't want to eat it? 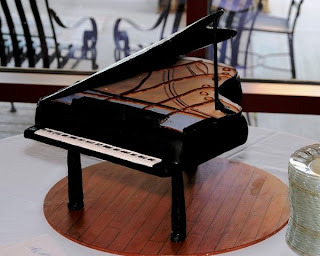 People who make cakes like these ones? Nice, huh? As it turns out, I am not one of those people. 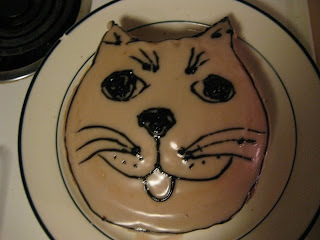 I don't have the patience to make cakes look that amazing. I tend to leave them on the tray on which I made them; I leave marks where I wiped things off; everything is a tad lopsided ; there are drips and spills and occasionally there are fingerprints; and often I don't make the right type of icing so the cake looks just a little bit wrong. My cakes look like they were decorated by hand whilst wearing mittens. However, the cakes I make are greeted with cries of delight by the people for whom they are made, because they know that their cakes would be equally drippy, lopsided and careless. My cakes are greeted with joy because the cakes are made with love... and let's face it, chocolate cake is chocolate cake and my mouth doesn't know the difference. So, here are the cakes I made for home group tonight to celebrate three birthdays. The first is a cat, in honour of one friend who recently bought a kitten. She and her husband are the most over-protective cat owners I've ever met (their cat is drinking filtered water) but it's only because they love him. 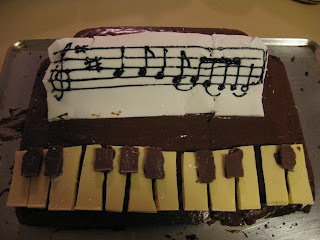 The next cake was for two people, both of whom are musicians. Here's the stroke of genius - the music on the piano is actually part of one of my friend's songs. She is fairly well known in Christian circles and her songs are sung in many churches so it was easy to find her music online. I thought that was a cute touch on the cake. The cakes look so nice that now I am hungry. Wow, I'm amazed! HOW did you cut the chocolate for the piano keys? Every time I try that sort of stunt it all goes horribly wrong. They look wonderful! Lopsided, quirky cakes beg to be eaten so much more than freakily perfect cakes. You think, "I'll just even up that bit... and that bit... nom nom nom..."